The facility that I am currently rotating at asked me to assist in preparing a women’s heart health event using resources from the facility’s women’s clinic as well as another Registered Dietitian. 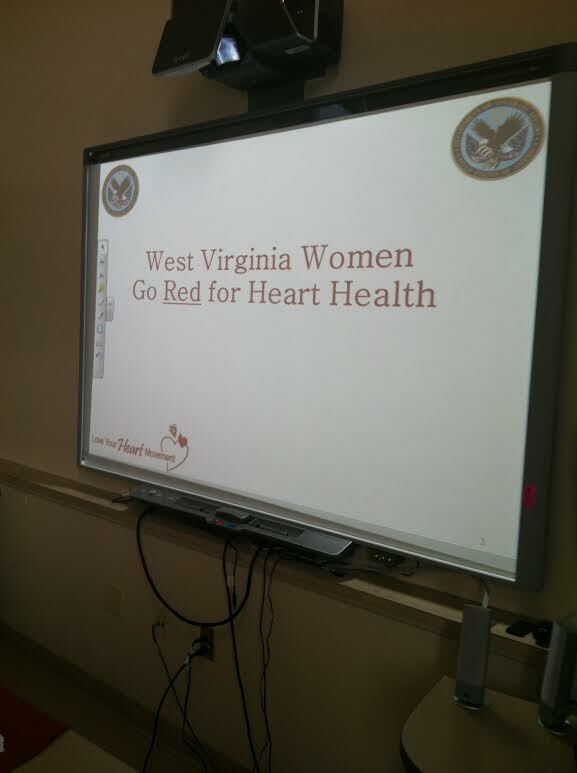 So, with the help of WVU’s Extension Service Love Your Heart Movement, I prepared a PowerPoint presentation on women’s heart health and the importance of keeping West Virginia’s women healthy. Of course, on Tuesday, West Virginia was hit with another spell of bad weather. So, not as many participants could attend. But we still had a very good turnout. I led the presentation with the majority of the information coming from another Love Your Heart Movement presentation, but I also incorporated some tables and graphs from the Center of Disease Control and Prevention (CDC) as well as tips from the American Heart Association’s Life’s Simple 7. Midway through the presentation a Registered Dietitian had an activity showing the differences between healthy fats and unhealthy fats. 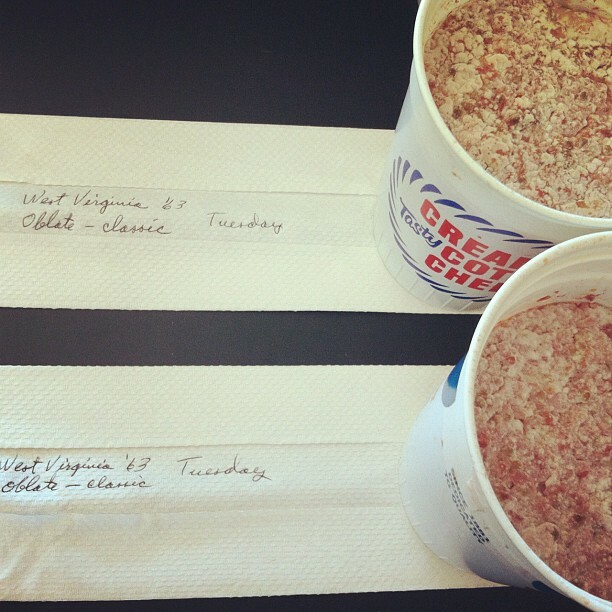 Some healthy fats that were displayed were walnuts, almonds, and canned tuna fish. Some unhealthy fats that were shown were butter and Crisco. This was done to show the difference between the health risks/benefits between solid fats and liquid fats as well. We prepared for this presentation for weeks. And I’m really glad that I assisted with it because the women’s clinic at this facility is considered a special population due to the high volume of male patients they attend to. The participants seemed very engaged and willing to make those small steps towards becoming heart healthy! I’d also like to say thank you to WVU’s Extension Service Love Your Heart Movement for not only providing the supplies, handouts, and supplemental information from one of their Extension Agents but also for providing the magnets and pins we gave the participants as incentives. The participants loved the items and information and we’re hoping for an even bigger event next year! Our Fats Demonstration! What’s Healthy and What’s Not? 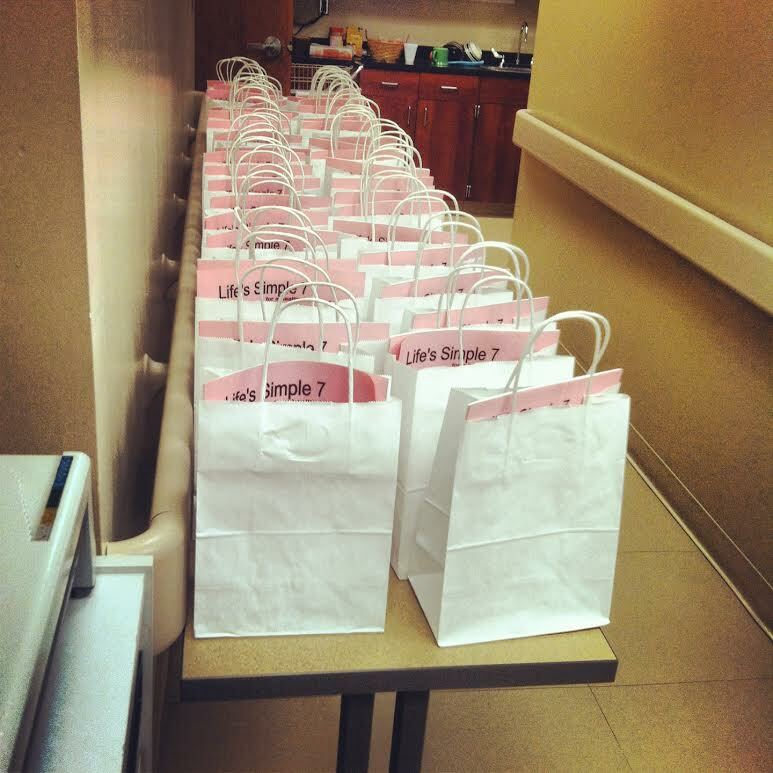 Gift bags for the participants which included handouts, magnets, pins, and much more! 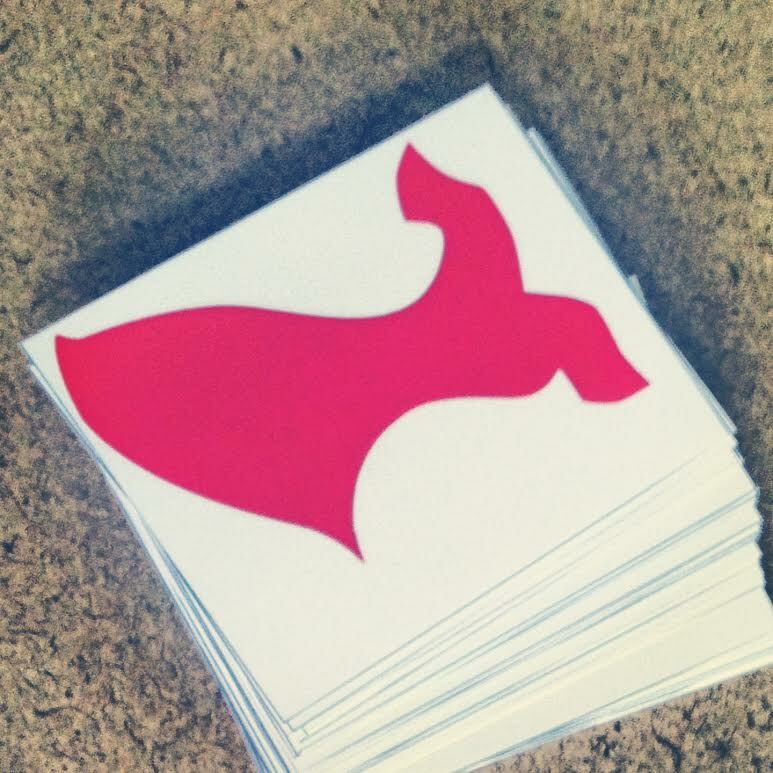 I made red dress cards for all the participants to write their own personal goal for their heart health. Then, we will hang the cards (similar to a clothesline) in the women’s clinic lobby area! 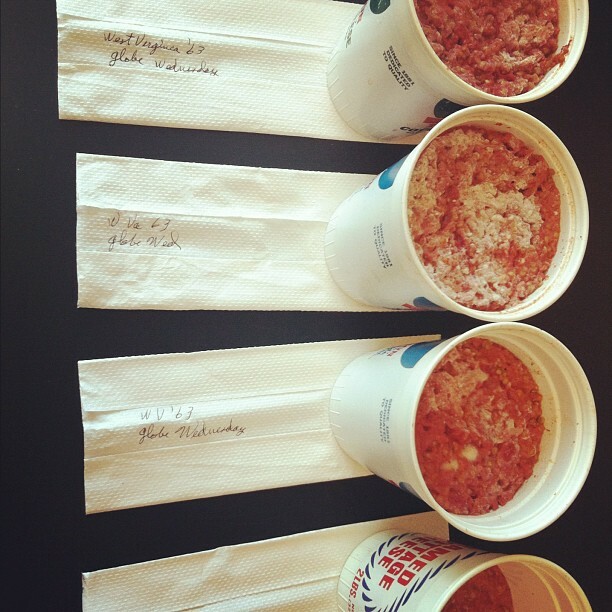 Go Ahead… Pick Your WIC!! Well, I am currently in full swing of rotations! As of right now, I am rotating in the morning at Taziki’s Mediterranean Café for Institutional Foodservice and at West Virginia’s Monongalia County WIC office in the afternoons. 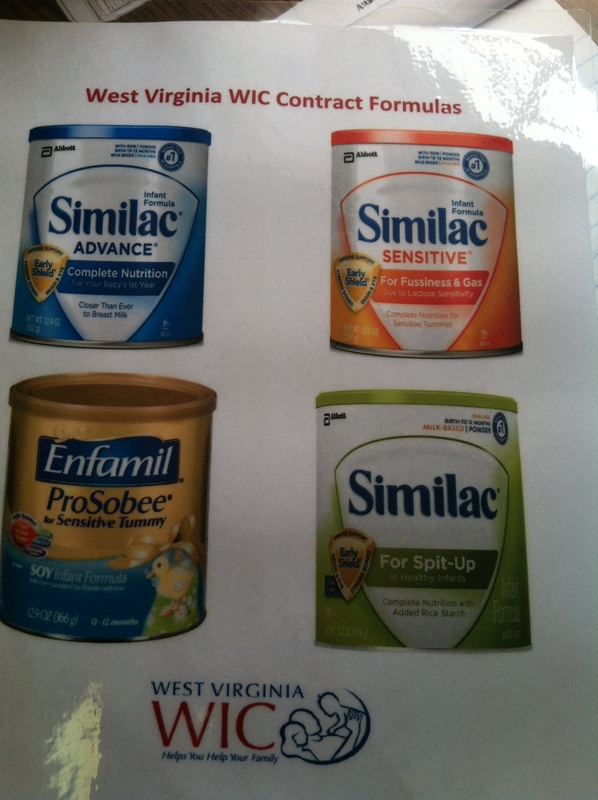 WIC is available for so many different types of families. The program is available to married and single parents, working or non-working, those receiving other types of aid or not participating in any other programs. Even if you are a grandparent, foster parent, or other legal guardian of a child under the age of 5, you can even apply for WIC. WIC is available to expecting mothers, up until 6 months after the end of their pregnancy. Infants are categorized in another group and covered from birth – 5 months old. Children are covered from 11 months – 5 years of age. And throughout their childhood, they have appointments every 6 months. Today marked my “official” first day at the WIC office. Every Monday, Tuesday, and Thursday, the Mon. County WIC schedules their nutrition clinics to see participants for follow-up and new client assessments. 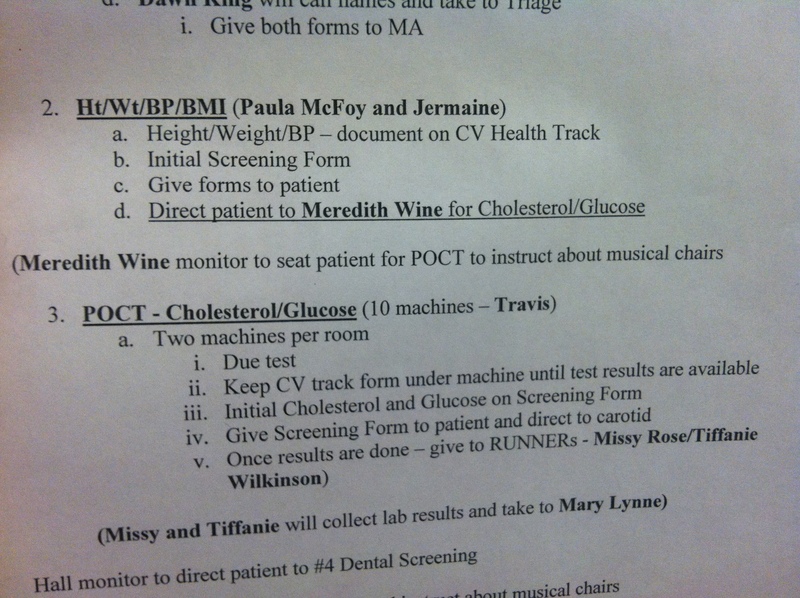 This afternoon, I observed a Registered Dietitian at WIC, assess 4 different appointments. Each participant with a nutrition clinic appointment attends or completes an online nutrition education class 3 months prior to their appointment. The nutrition education classes cover a variety of topics like infant nutrition, nutrition during pregnancy, and shopping on a limited budget. Within the participant’s assessments, WIC RDs ask the parent(s)/proxy, who may also be the primary food preparer, a series of assessment questions. More importantly, these questions should spark a conversation with the participant(s) to try and get the most information about the nutritional status of the client. The suggested assessment questions are broken into three categories: women, infant, and children… How fitting! 1. Powder: Powder formula that is combined with water, usually cereal formula. 2. Concentrate: Liquid formula combined with water, usually producing a bubbling effect. This formula may not be best choice for a child with nutritional problems like spitting up or reflux. 3. Ready-to-Feed: Requires no addition of water. Overall, I think the first day went really well. I still have a lot to learn and honestly, I’m soaking up the entire experience. I have a list of other projects that I will be completing at WIC so; I’ll have much more to talk about in the upcoming weeks! 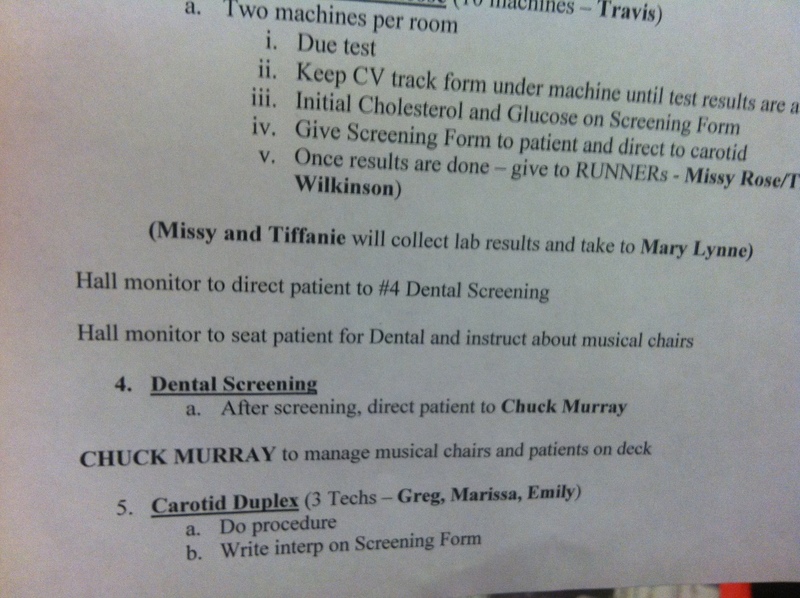 A laminated visual that an RD at WIC has on-hand to show clients at appointments. 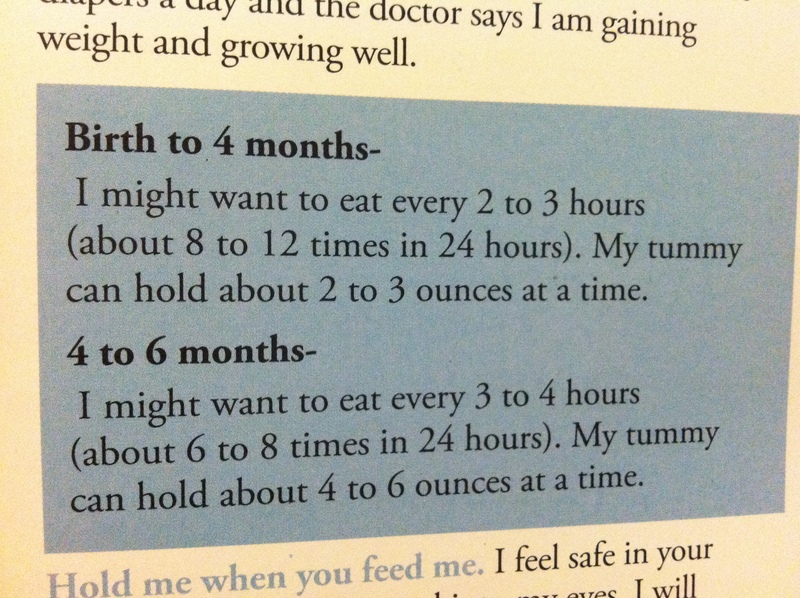 Information that is provided within one of WIC’s several pamphlets for participants, based by age of child/infant. The “buying local” trend has emerged within the last few years. In the United States, especially in West Virginia, food agriculture businesses are finding themselves at critical and electrifying times of opportunity. From 2006 to 2008, West Virginia small restaurants and hotels showed a 360% increase in purchases of local products. In the 2012-2013 school year, the WV Department of Education committed $250,000 in school food funds for local purchases. More than a dozen of county school systems reported buying directly from West Virginia farms in 2012, while four of these began buying locally since September 2011. Even the Martinsburg VAMC sees fresh, healthy meals as an ingredient of recovery for their patients and has spent over $23,000 on local food. From 2002 to 2007, 39% more local West Virginia farmers began selling directly to consumers. And the dollar amount of direct-to-consumer sales increased by 55%. This means that farmers are capturing a greater portion of the consumer food dollar by marketing products as directly as possible from farm to table as demand grows, new business models are also emerging to provide the kinds of processing, aggregation and distribution required to meet the needs of sophisticated buyers. This growth creates jobs for farmers and also for other parts of the state’s economy. A recent study by Downstream Strategies, LLC and WVU showed that if West Virginia farmers grew enough produce to meet the in-season fresh produce needs of all state residents, the shift would generate 1,723 new jobs and would result in about $190 million being retained in the state instead of flowing beyond its borders. Increased local sales of West Virginia products also creates the need for businesses that collect, process and distribute local food, which creates more local jobs. For example, one Iowa study found that every 1,000 cattle sent to small meat processing facilities supported 7.4 processing jobs. So a common question that you might find asking yourself is… What exactly does “buying local” mean? There is no universally agreed-upon definition for the geographic component of what “local” or “regional” means, consumers are left to decide what local and regional food means to them. A 2008 survey found that half of consumers surveyed described “local” as “made or produced within a hundred miles” (of their homes), while another 37% described “local” as “made or produced in my state.” The ability to eat “locally” also varies depending on the production capacity of the region in question: people living in areas that are agriculturally productive year-round may have an easier time sourcing food that is grown or raised 100 miles (or even 50 miles) from their homes than those in arid or colder regions, whose residents may define “local food” in a more regional context. The Morgantown Farmers’ Market, for example, sells products that are grown or made within 50 miles of Morgantown city limits. So all of their products are supporting small family farms. So, West Virginia has developed a “food charter” that’s designed to help us all focus, measure and celebrate our collective progress towards stronger local food systems. This Road Map for the Food Economy offers a vision for WV’s local food economy and provides ways of measuring how statewide and local policies, programs, and community efforts are contributing to the strength of this food economy. The Road Map is broken down into 2 parts: an action plan for building a food and farm economy over the next 5 years; and a “Food Economy Score Card” which allows us to measure the cooperative progress towards the goals of the action plan. The Food Economy Score Card will be updated annually and then the positive changes and progression will be distinguished in an annual report. This Road Map is for everyone!It’s offered more as a tool to help people (and consumers) in West Virginia understand the key opportunities of the food policies and economy. Local government, citizens groups, policy makers, farmer groups, foundations, agencies, economic developers and other concerned groups are invited to adopt or adapt the Road Map as a guide to form an action plan for their own efforts. So, how can you get involved? 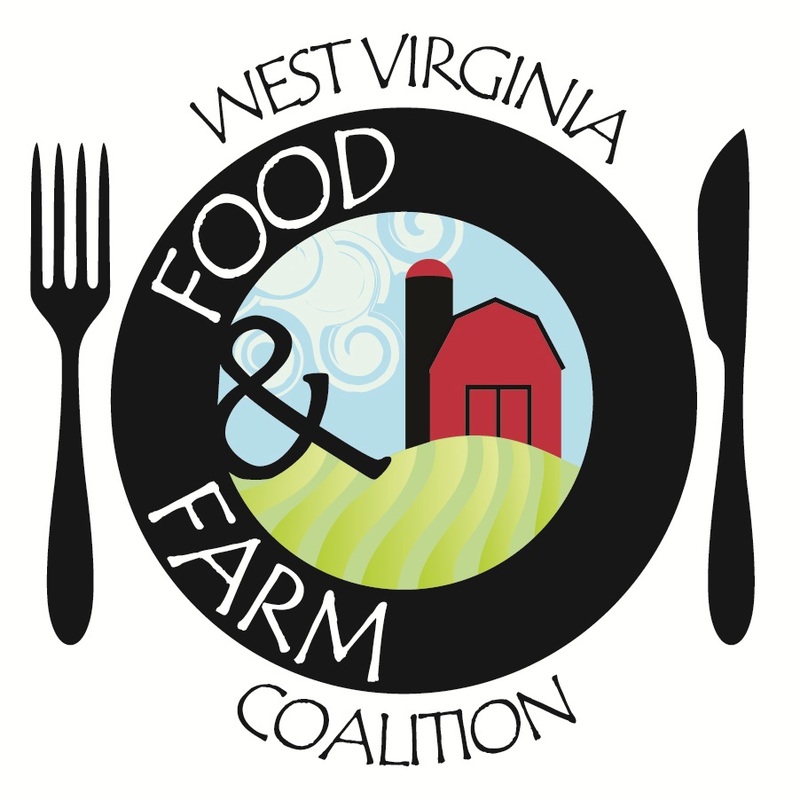 – Stay connected to statewide organizing efforts through the West Virginia Food & Farm Coalition by signing up for our newsletter, and by attending statewide events hosted by other groups — such as the West Virginia Small Farm Conference, hosted by WVU Extension Service and its West Virginia Small Farm Center. – Buy Local: set a goal for how much your family, business or agency will spend on local food. At home, consider buying at least $10 worth of locally produced food per week. At work, consider sourcing at least $500 worth of local food for events and meetings each year. – Find simple ways to work on the Road Map’s action items within your own community. Tell your school superintendent about the importance of Agriculture Education; let a farmer know about farm to school opportunities, or help start a nutrition education class at your local farmers market. If you are part of a civic organization, help that organization choose an action item to work on this year. Why should the Road Map matter to you? The problem that I’m really trying to shine light on is the fact that food access has a HUGE effect on food insecurity in the U.S. right now. The State Indicator on Fruits and Vegetables 2013 reports that the percentage of census tracts with at least one healthier food retailer within a ½ mile of tract boundary in West Virginia is at 59.3%. Currently, West Virginia does not have a healthier food retail policy. West Virginia also does not currently have a state-level farm-to-school/preschool policy. The entire state only has 1 food hub. Yes, only one! And West Virginia has no local food policy councils. That’s right… zero! As a community why can’t get try to enclose this gap in food access with the products that are right in front of us? Well, only time will tell how this community attempts to resolve this problem. 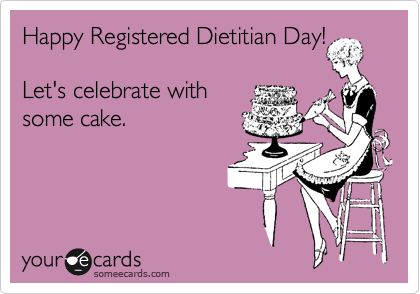 Happy Registered Dietitian (RD) Day!! 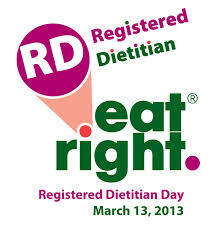 March 13th celebrates Registered Dietitian Day! This celebration occurs every year during National Nutrition Month, which is March. RDs are the public’s go-to healthcare professionals when they need reliable nutrition information, in this field. RDs pull from their experience to create a personalized nutrition plan for people of every age. These are the professionals that are able to separate facts from fads and translate nutritional science into information you, the consumer/client/patient, can use! Dietitians can improve the health of Americans and save money through healthcare costs. Medical nutrition therapy (MNT) provided by RDs is critical in preventing the top 3 chronic illnesses. It is well documented that MNT is associated with a decrease in utilization of hospital services of 9.5% for patients with diabetes and 8.6% for patients with cardiovascular disease. Also noteworthy is that participation in community-based programs that focused on improving nutrition and increasing physical activity had a 58% decrease in incidence of Type 2 Diabetes. Registered Dietitians assist to promote a net decrease in healthcare utilization and costs for most people. The Robert Wood Johnson Foundation estimates that in Idaho, for every $1 spent in wellness programs, companies could save $3.27 in medical costs and $2.73 in absenteeism costs. Some interventions have been shown to help improve nutrition and activity habits in just 1 year and had a return of $1.17 for every $1 spent. Reducing the average BMI in the state of Idaho by 5% could lead to health care savings of more than $1 billion in 10 years and $3 billion in 20 years. Well, unfortunately Wild and Wonderful West Virginia isn’t as lucky as ole Idaho. West Virginia still leads the nation in obesity, and was recently named the state with the highest number of overweight residents in the union. According to the 2012 Gallup-Healthways Well-being Index released last week, 33.5% of West Virginia’s population is considered obese. 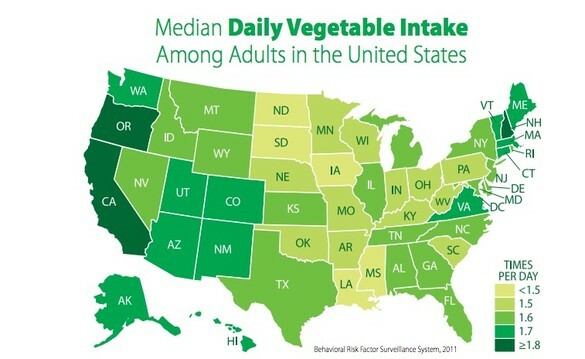 Mississippi is the closest with an obesity rate of 32.2%. Arkansas has a rate of 31.4%, Louisiana is 30.9% and Alabama is listed at 30.4%, to round out the top five. Residents of the Mountain State believe that a reason for the high obesity rate is the change in physical jobs and increase in availability of fast food. The combination of lack of physical activity and the ready access of fast food and junk food in homes has really contributed to the epidemic. On the flip side of our state, nutrition-related efforts seem to be working as West Virginia is no longer in the top five for childhood obesity! With the help from schools and communities, West Virginia is increasing physical activity and need for healthier foods. As a unit we are advocating and promoting activity and nutrition. I think it seems to be helping! All thanks to those RDs out there!!! Job outlook: According to the Bureau of Labor Statistics, Nutrition and Dietetics careers are expected to increase much faster (by 20%) than other jobs by 2020 and faster than many other industries within health care. In 2010, the median annual salary for RDs was $53,250, at $23.60 an hour. And the number of jobs available in the nutrition and dietetics field was 64,400. This past week, I had yet another Extended Community Action Team meeting. Within this meeting, I have 3 undergraduates on my Action Team. They each represent a different aspect of community nutrition off-campus in the Morgantown, WV surrounding area. One of those interns is responsible for community nutrition education at the Shack Neighborhood House. Since we instilled a rainbow nutrition curriculum last semester, I wanted to try something a little different. I remembered a show that Rachel Ray hosted, where she would travel the country and try different foods and restaurants based on that region and she was on a budget. So, since the ISPP Dietetic Interns most recently were solely responsible for a successful food culture nutrition and culinary education class… I thought this could be like a food culture program but, only within the US. 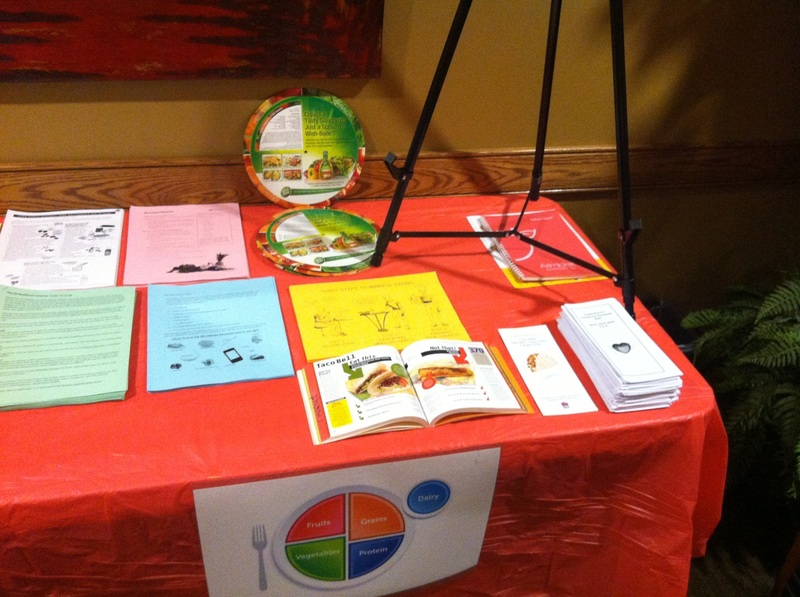 So, out came the new nutrition education curriculum called “Our Healthy Roadtrip”. 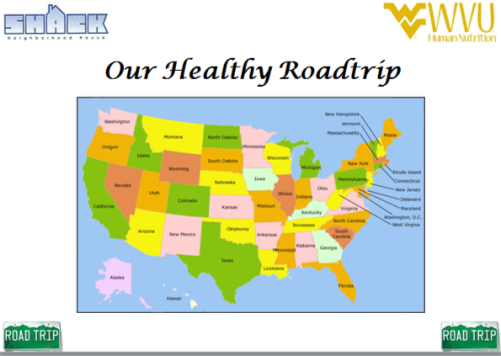 Each week, for 6 weeks, students from the Human Nutrition & Foods department at West Virginia University will educate children in grades 3-5 on different food culture based on different regions of the country. 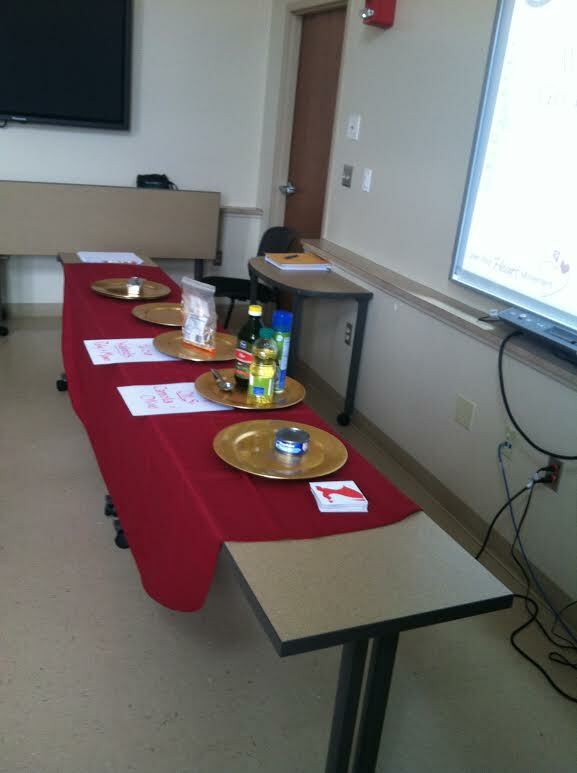 Then, they will focus on one specific food and have a snack and interactive activity corresponding with the curriculum. This new program starts on March 4th and will continue until mid-April. I think the students at the Shack Neighborhood House will really get a better sense of the country and what it has to offer, in regards to nutrition and food culture as a whole. The location of our new nutrition education curriculum! A poster I created that will be on display at the SNH for the remainder of the programming! On Friday February 1st, the ISPP and GDI Interns were asked to come to the WVU Heart Institute to set up for the upcoming event that was taking place the next day. 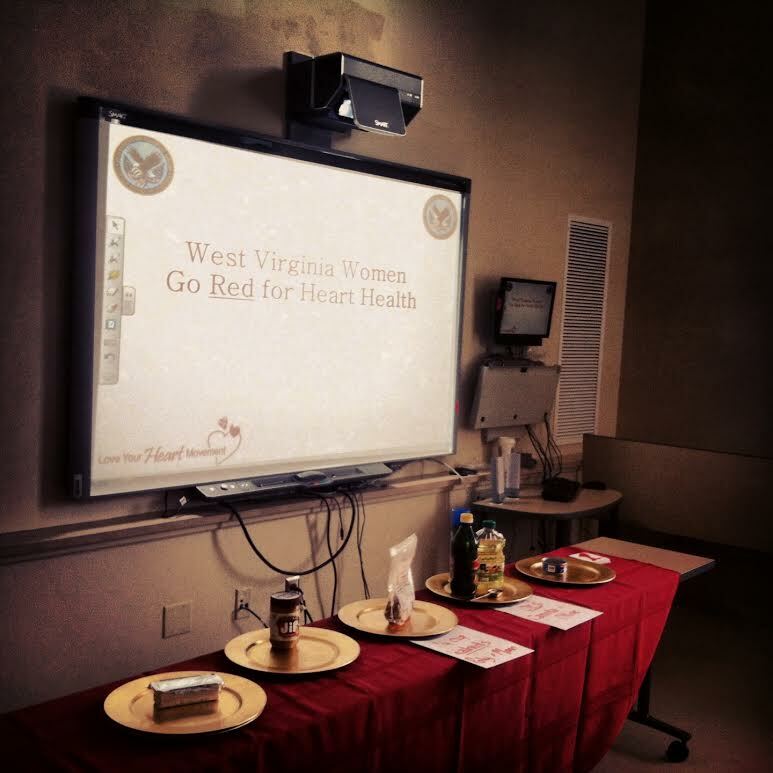 Elaine Bowen, a WVU Extension Specialist, asked us to attend the “Love Your Heart Fun Lunch” event. This event is a free health screening fair that participants attend, on a first come, first serve basis. The day before the event, volunteers and coordinators took time out of their day to prepare for the health screening extravaganza. Volunteers from the School of Nursing and the School of Pharmacy, from WVU’s Health Sciences campus (HSC), were in attendance at the set up event. 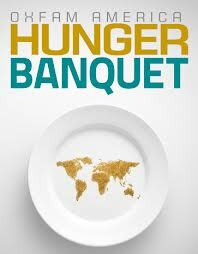 It was communicated that we, “nutrition people”, arrive to start help setting up at 5pm on that Friday. Well, since there was only two ISPP Dietetic Interns (including myself) that were going to be responsible for our “Community Nutrition” table, I told Kaylyn (the other ISPP Dietetic Intern) that I would go to the set up event. I did this because there really was no reason to have two people setting up our table. I arrived with my materials, posters, handouts, and other nutrition equipment and waited for instructions, with other students from HSC. To my surprise, when introductions from coordinators started to begin, I was introduced to the whole group of students because I was the only nutrition person who arrived to set up prior to the event. 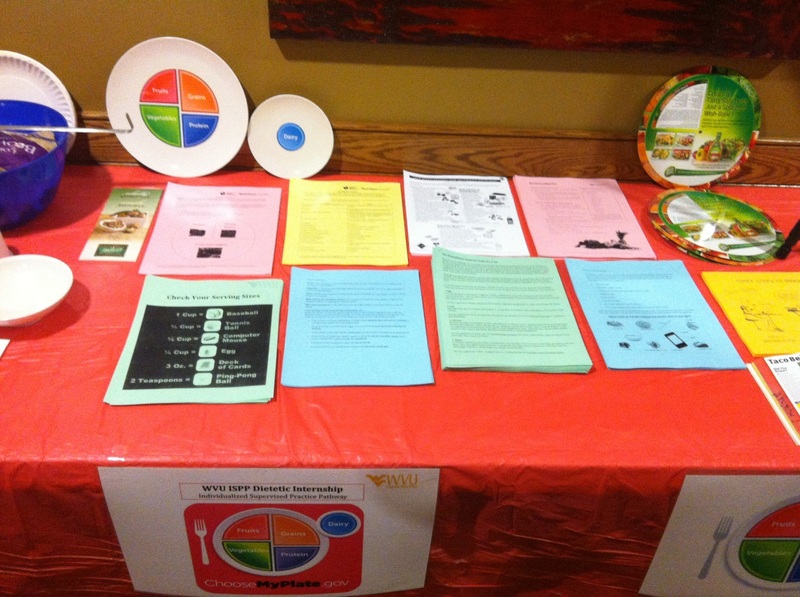 The GDI Interns were administering the screening process (meal planning) of the health fair and the ISPP Interns were responsible for a “Community Nutrition” table in the waiting area for participants to interact with and gain a little more health-related information. Since I was the only nutrition person to attend the event set-up, this gave me a few opportunities to take time to meet everyone that was involved in the planning and organizing of the event. 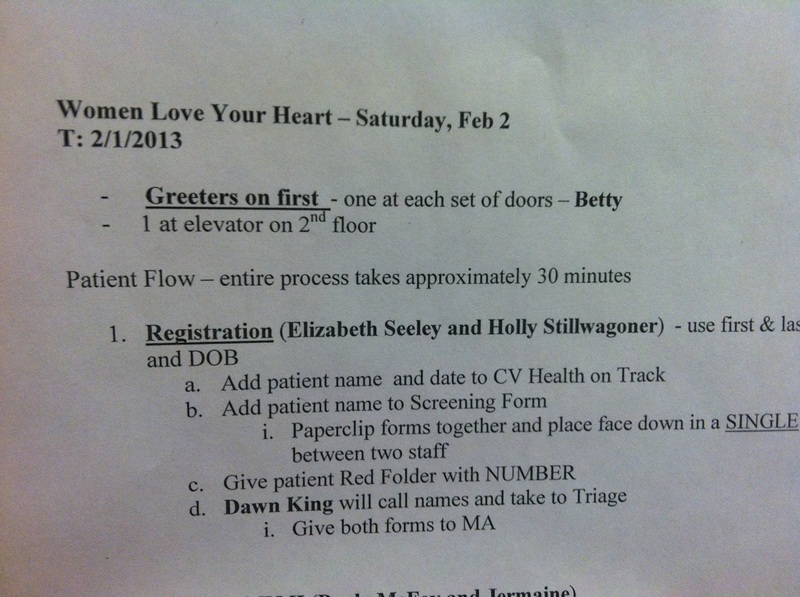 The coordinators provided everyone with an itinerary and a map of the heart screening. The coordinators also shared with the group a Proclamation signed by the Governor of West Virginia, which was my first time seeing anything like that before. Then, the other volunteers were given a tour of each station of the heart screening maze for the next day. Since the ISPP Dietetic Internship table was in the waiting area with other community partners, like the School of Dentistry and EMS, I opted to help others move furniture and carry items inside from coordinator’s cars. I actually ended up getting the ISPP table set up fairly quick so, I helped with anything that anyone needed help with. Overall, I’m glad I came to set up because it made the next morning less stressful for Kaylyn and I. I also had the opportunity to network with other students and faculty in WVU health-related fields. And the right side of our table. The only piece to this puzzle that was missing was Kaylyn’s “Fast Food Quiz”, which she brought the next morning. 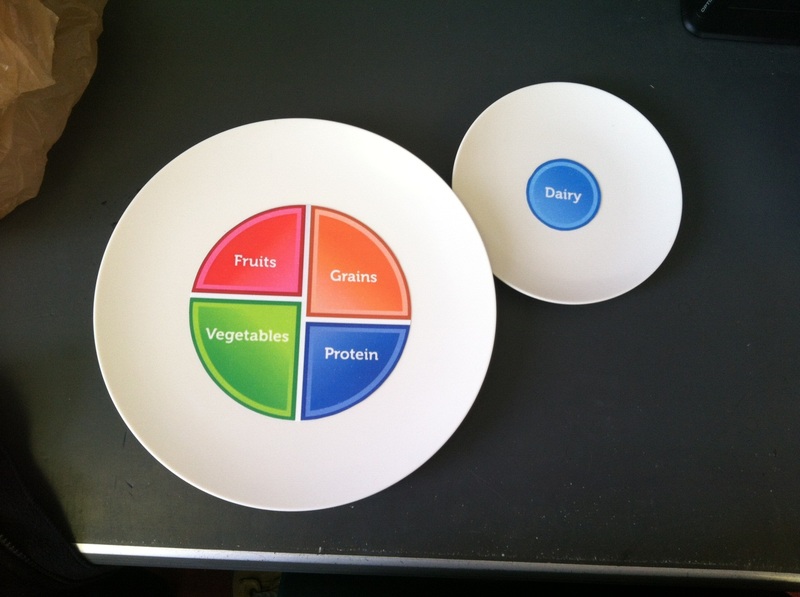 A visual I created for participants to realize what the MyPlate actually looks like, compared to an actual oversized plate that most Americans use in their home on a daily basis. 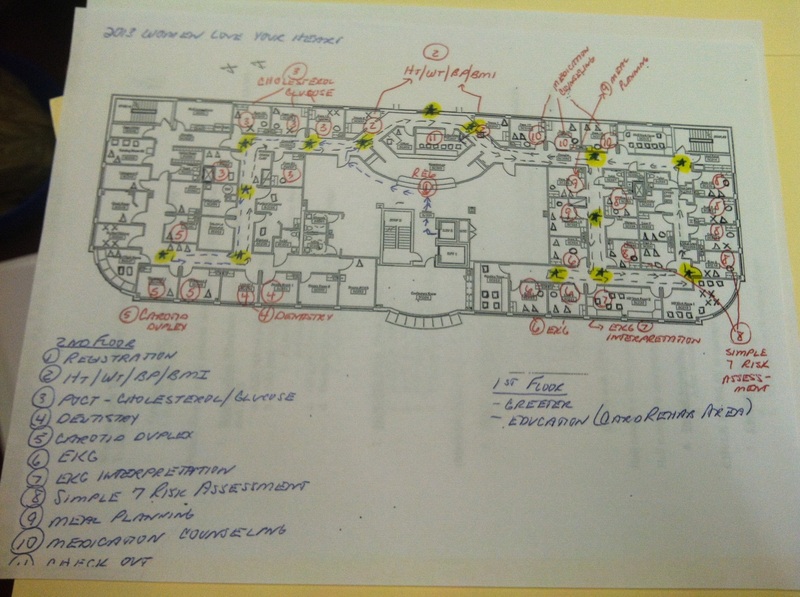 The volunteer’s map of the heart screen- to look over in case participants need help finding stations the next day. 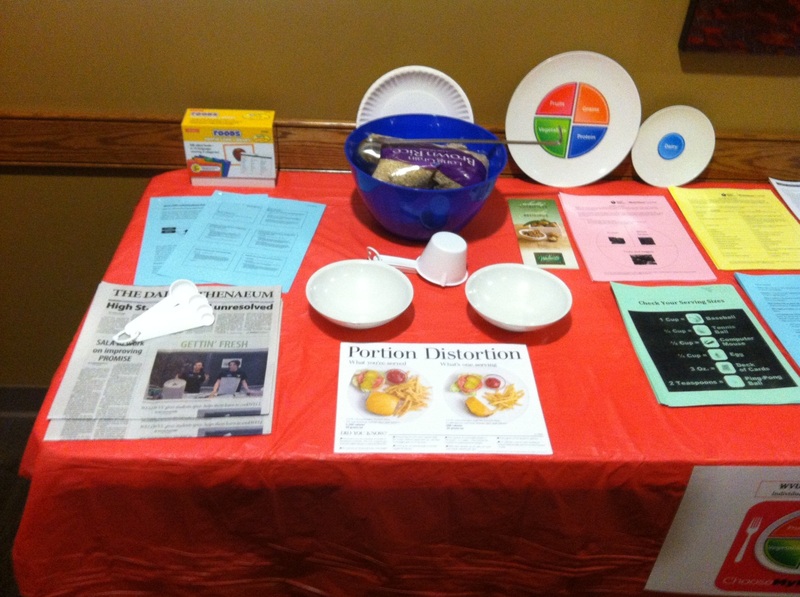 Overall- what the ISPP Dietetic Internship Community Nutrition table looked like the night before the event took place! Community Nutrition Action Team Engage! As an ISPP Dietetic Intern, we have an emphasis area of “Leadership in Community Wellness”. Therefore, each intern is assigned an Action Team based on an area of “LCW” that we are most associated with. 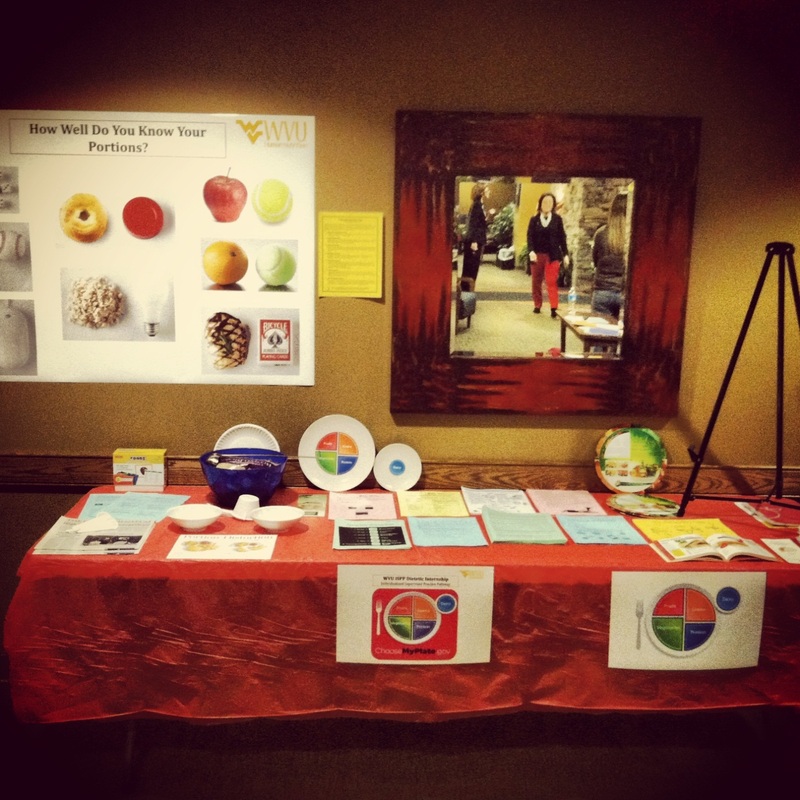 I am the ISPP Dietetic Intern responsible for the Extended Community Wellness Action Team. This team is comprised of WVU Human Nutrition & Foods students that applied for positions as Undergraduate Interns (HN&F 495 Independent Study credit). The first Extended Community Undergraduate Intern Action Team meeting took place this week on Tuesday January 29th. On the action team, I have an undergraduate intern for (1) WV Action For Healthy Kids, (1) Children’s Discovery Museum of West Virginia, and (1) The Shack Neighborhood House and Davis College of Agriculture, Natural Resources, and Design. Bringing my team to a total of 3 students. In our meeting, I distributed tables of meetings, projects, programs, and presentations that each undergrad intern will be responsible for throughout the semester. I distributed all 4 tables to each student on my action team so, everyone knows what everyone else is doing and playing a role in. I think this will help prevent any confusion as to what each undergrad intern’s role will be throughout the semester. As a team, I expect all 3 students to attend all Action Team meetings, as well as keeping notes of every meeting and emailing these notes to me by the Sunday after our meeting. This way I can see if the students understand their role on the Extended Community Wellness Action Team and if anything needs to be clarified at the next meeting. Currently, I have told this Action Team that our focus is to get “The Casserole Club” organized and lessons start being developed. At the end of the semester, I expect a PowerPoint presentation of what everyone completed throughout the semester. This presentation may OR may not be a group presentation, depending if our final meeting is concurrent with the other Action Teams (Collegiate, Worksite, Social Media). “Happy School”- A program for new, young parents with young children that meet Tuesday, Wednesday, and Thursday 9:30am-12pm. So, our program would either take place Tuesday or Thursday 10am-11am OR 11am-12pm. SNH recently just received a small grant that they plan on using towards preparing easy, healthy recipes and delivering/serving clients. They are interested in having HNF students help. A program educating students on campus (undergraduates/graduates) about food culture awareness, nutrition education, and culinary skill-building. Organized information and recruitment for an event that the WVU School of Pharmacy invited us to. The information was presented to the West Virginia Grief Center. So, stay tuned ladies and gentleman… You’ll be reading some very interesting community nutrition blogs within the next few days! 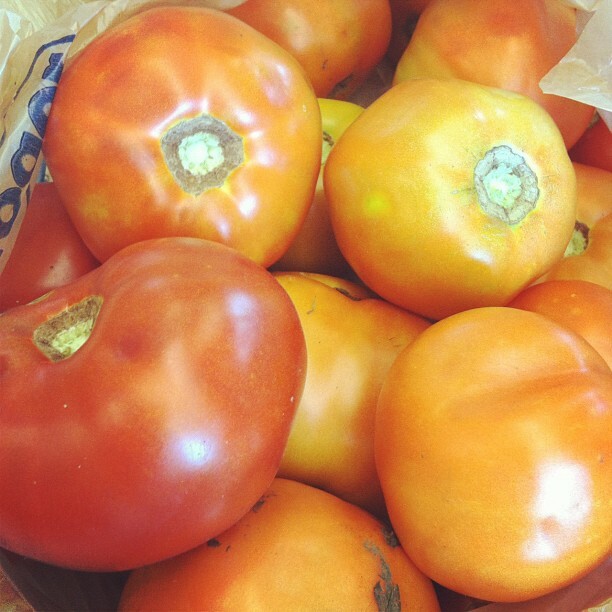 What is the West Virginia ’63 Heirloom Tomato? So, next year the state of West Virginia will be 150 years old! In celebration of WV’s 100th birthday in 1963, the Agriculture Experiment Station released the Centennial Tomato (also known as the West Virginia ’63 tomato). The tomato was popular across the state and is still grown in many home gardens. 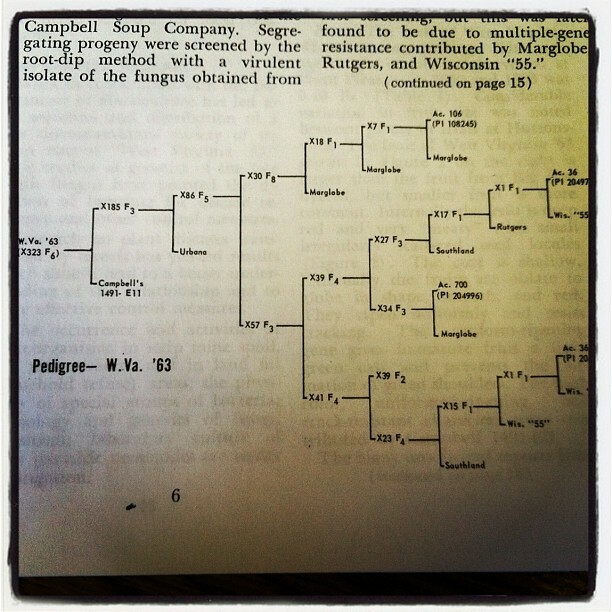 The WV ‘63 tomato was bred at WVU by Dr. Mannon Gallegly who is an emeritus professor of plant pathology. Dr. Gallegly recently told us that it took 13 years for him and his associates to create this rare and special tomato breed. 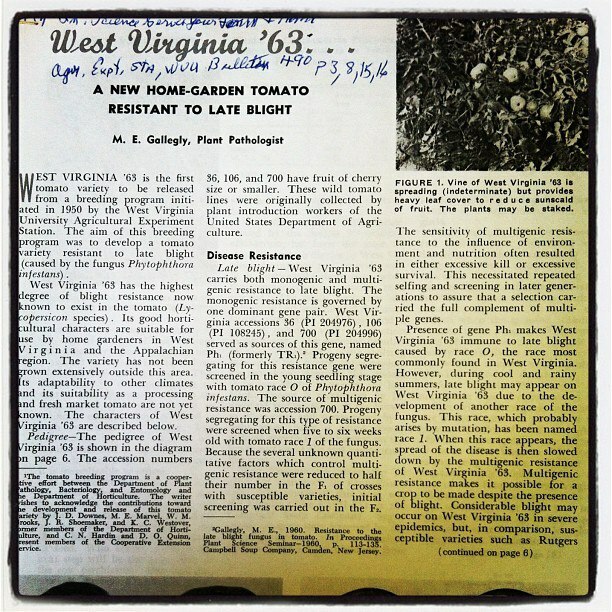 He started his WV ’63 tomato journey in 1950 and finally finished in 1963, then was published for his work in 1964. 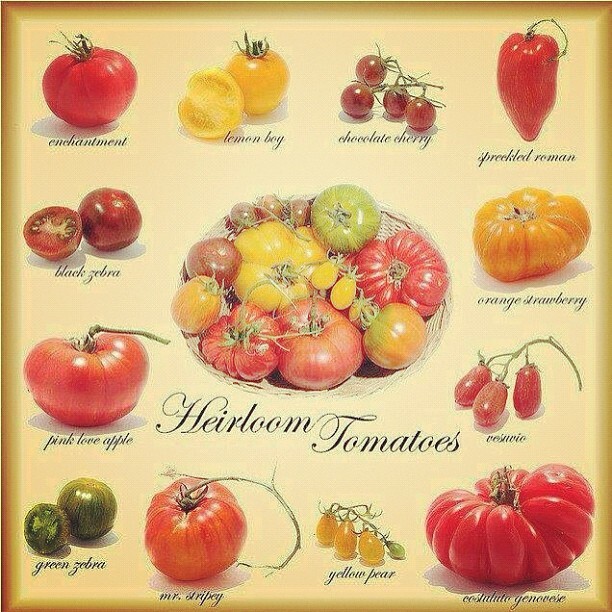 The tomato was cross-bred with several other tomatoes before it was created and discovered. The reason that this WV tomato is so very special is because is maintains a “blight resistance”. Blight is the natural reaction that tomatoes have from fungus. Visually, it looks as though the tomato has physical flaws on the surface. Our WV ’63 tomato has a resistance to this reaction therefore, doesn’t have physical imperfections. So, you could say it’s perfectly made in the state of West Virginia!! Dean Robison, of Davis College, heard the story of the WV ‘63 tomato. He has asked if we could do something next year, 2013, in recognition of what happened 50 years ago and which could also bring recognition to WVU and what Davis College does for the state. Our main goal is to not only highlight this heirloom tomato of WV’s but, also incorporate Davis College into the promotion of it because we were the first college at WVU. 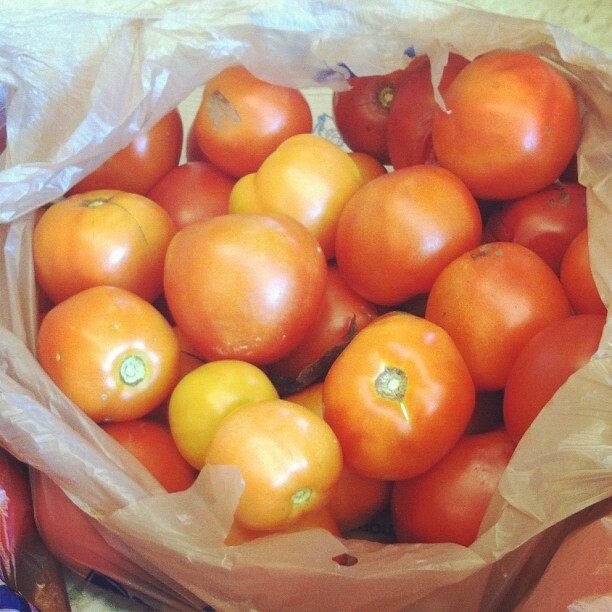 So, we want to promote “our” tomato not only across our entire campus but, also state-wide. So, as part of a campus-sponsored event we thought of an idea to incorporate different parts of Davis College into the brainstorming process. My advisor, Megan Govindan MPH, MS, RD, LD, asked Dr. Debbie Christel Ph.D., ABD, who is new to WVU from Oregon State University, to collaborate on a “WV ’63 Heirloom Tomato” T-shirt idea. Dr. Cristel is a faculty member with Textile Apparel and Merchandise in the Davis College and is experienced in the area of athletic apparel and exercise motivation. She is also familiar with the founder and company of “Sustain-U”, a sustainable t-shirt company in Morgantown. Ironically, tonight is also the Davis College picnic, where the “T-shirt challenge” can be introduced as well. 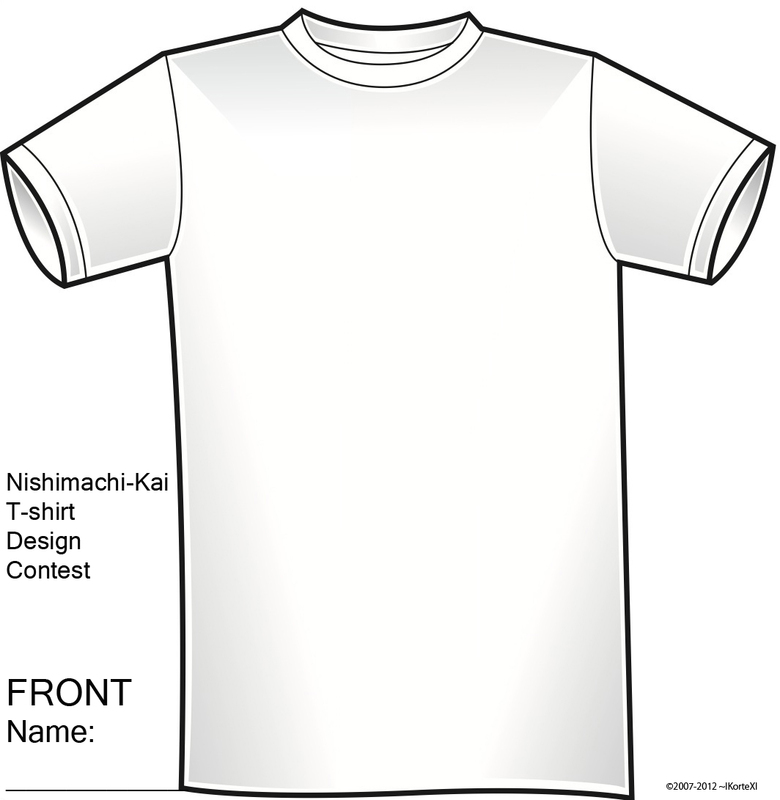 So, Dr. Christel Ph.D., ABD thought it would be a great idea to promote the t-shirt competition with a template that she created (attached) and set up drawing materials at the Apparel Design student club booth. Then, the students and faculty can vote on the best designed logo and use that design for the merchandise. Deer season is approaching quickly- would sell fast! WVU Woodsmen team could help promote? Alpha Gamma Rho could help advertise? Sigma Alpha could help sales? This idea has me especially excited. I was thinking that a pasta sauce could be made from ’63 Heirloom tomatoes and sold during the holiday season. Or we can even have a recipe for ’63 pasta sauce for alumni to have over the holiday season. My family, personally, uses pasta sauces specifically during the holiday months so, this could even be a Christmas present ideas for families that have sent their children to WVU. The Italian American Organization (IAO) could potentially promote, advertise, and help Davis College sell the products. This would mean cross-college team work towards the WV ’63 Heirloom tomato!! On all 3 campuses during the birthday celebration. Davis College could sell WV ’63 Heirloom tomato sandwiches at WVU football game tailgates or basketball games and a portion of the sales could go towards the Ronald McDonald House. This idea will have a higher service learning component as well as promoting how awesome Davis College is! I can honestly say, as a Pennsylvania-born girl and West Virginia resident, I am beyond excited to start working on this project. It is seriously bringing the whole Davis College together to work on such a special agriculture heirloom to the state. Its things like this that makes me proud to say that I’m 2 very special and important things…… A Mountaineer and a Davis College graduate student. 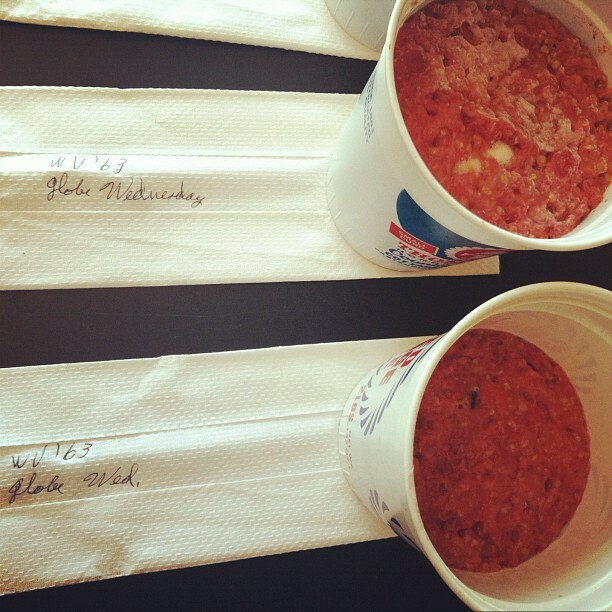 ’63 tomatoes straight from the field! The 13 year process it took to make the ’63 tomato. This picture includes all of the cross-bred hurdles it took to create “our” tomato! What in the world is a Persimmon? The Middle East Loves Fast Food? April is National Preceptor Month! Documenting experiences throughout my internship: ISPP style. Follow me as I document my experiences as a dietetic intern at West Virginia University! 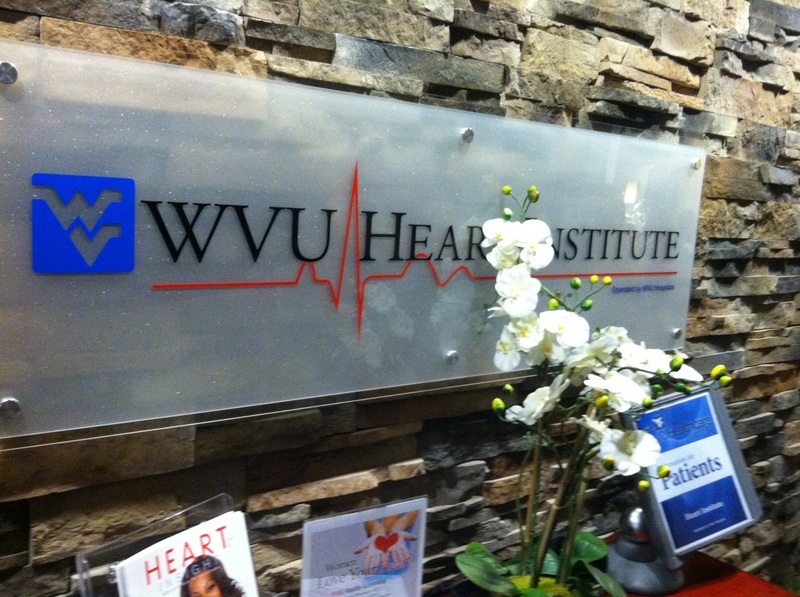 Welcome everyone to Remi's journey through her dietetc internship at WVU! Follow along and share my experiences in these next couple of years to come. I am a newly credentialed Registered Dietitian working in the Pittsburgh, PA area.